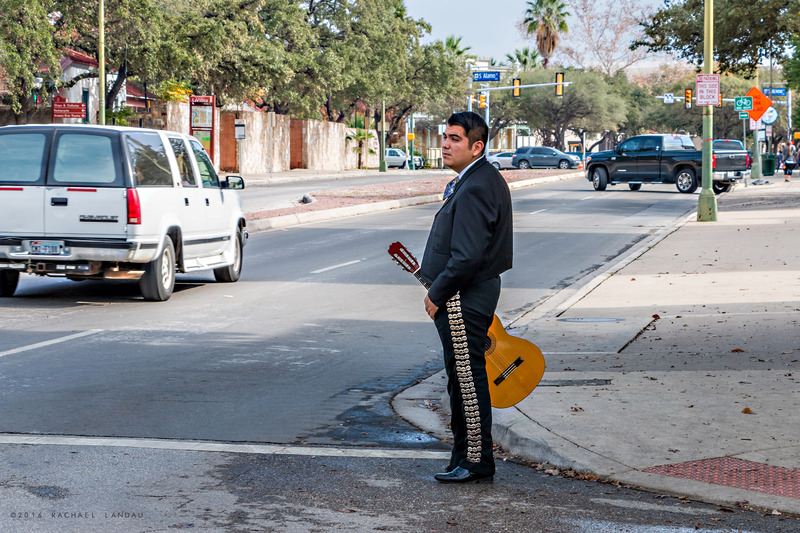 Strolling alone down a street in La Villita was this Mariachi musician dressed in a Mexican folk music costume. This well-groomed mariachi musician probably was on his way to entertain at an event. His charro suit, with tightly cut trousers, featured silver decoration along the legs, which harkens to uniforms worn by the mounted rural police prior to the Mexican Revolution of 1910. La Villita is a storied neighborhood located south of the River Walk in downtown San Antonio, Texas. It was a site of Coahuiltecan Indian, Spanish, Mexican, and Anglo colonial settlements. The Casas Revolt of 1811, when Mexican revolutionaries sought independence from Spanish rule, took place in this neighborhood. During World War II the area served as a Red Cross Center. After the war, the neighborhood was restored and re-purposed as a district for the preservation of early Texas and Spanish culture. Today La Villita is a small village managed by the city to foster arts and crafts with shops and galleries that attract tourists.